Birthday parties can be expensive! 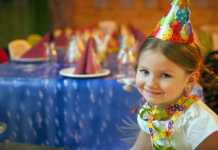 Are you looking for tips on saving money on kids parties? 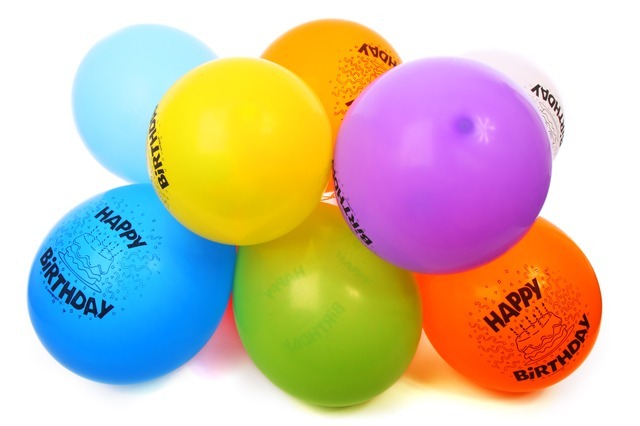 Hosting your son’s birthday party at home can be easily and affordably done, with just a little imagination and effort. Here are some Cheap Birthday Party Ideas for Boys. Generally, hosting the party at home is cheaper, than if you went out to a party venue, provided you are willing to make your own entertainment at home. These ideas for party themes and games should kickstart the imagination, and ensure a memorable day for you and your son. And the price is just the cost of the food, and your time! 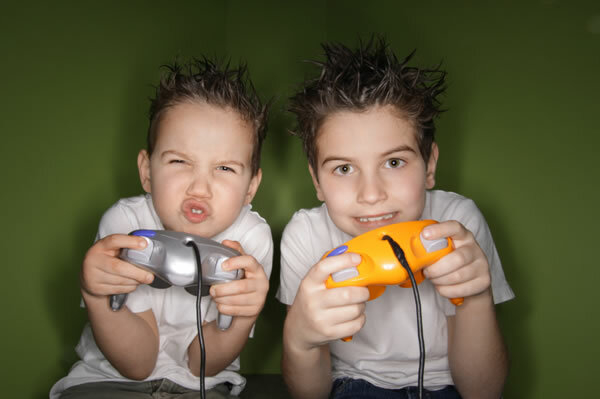 Set up the X-box or the Wii or invite friends to bring their own. Hold a tournament and have the boys play each other for the ultimate championship. This type of party works best with sports video games or racing games that can be played quickly and give everyone a turn to play the games. Provide pizza, snacks and cake and ice cream. Set up a table along one side of the room for snacks and let the boys help themselves. Good cake ideas might be a racing car or your son’s favourite character. You could decorate the room to resemble an arcade. Have music playing in the background. Print off pictures of scenes from the games or ask in a game store if they have any old posters they no longer need. Catchmyparty.com has free minecraft printables you can download including the invites ready to print and fill out. Or if you want the real deal, check out these cool Steve and Creeper piñatas available on Pinataspinatas.com. 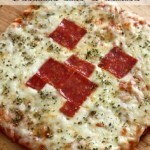 Mommadanddboyz has cool ideas for Minecraft themed games from Pin the Tail on the Pig to Minecraft bingo. Whip up a batch of Rice Crispy Treats using green food colouring and then carefully place square chocolate icing pieces onto make the faces. Make up a batch of blue jello for some “minecraft water”. You can buy 2 oz square mousse cups onAmazon.co.uk and Amazon.com , perfect for making your jellos square. 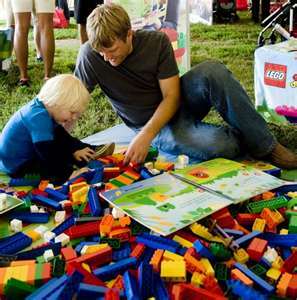 Invite your son’s friends around for a Lego party. Play Lego Pictionary- print out several cards with simple pictures of common objects on them such as a car, a robot, a boat or even some shapes. Ask the kids to choose a card and build that object. Once built, the others must try to guess what they have built. Next, hold a speed building competition where everyone gets 2 or 3 minutes to build a car and then vote on who’s is best. After that pick a LEGO minifigure to compete with. Outside you could hold a LEGO obstacle course. Each player will need their own Lego figurine. An example of a course would be to have the Lego figurine climb through the cardboard tube from an empty roll of kitchen roll. Then ride on a train set from one end of the track to the other. Next he must travel by a Barbie coupe or similar to end of the garden. Once he reaches the end, he just jump onboard a boat and traverse across an inflatable swimming pool. Once safely across he must aboard a spoon and fly to the opposite end of the garden where he will ride in a bucket down a zip line created with rope. Then he will be catapulted in a butterfly net to the finish line. Let the kids compete for the fastest completion time. For the cake, use mini-bread loaf tins and bake 12 mini loaf cakes. Ice each in the primary Lego colours ie. red, blue and yellow. Use the same colour M&M’s for the knobs on top of the blocks and pile them up randomly to look like a LEGO pile on a tray. 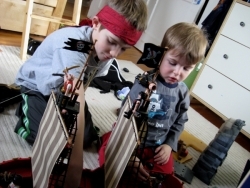 If your son is pirate mad, then this will be the perfect party idea for him. When the party guests arrive, wrap a pirate bandana around their heads. Give each a pirate tatoo on their arm, a pirate patch and perhaps a red sash to wear around their waste. Draw a beard or mustache on their faces to complete the look. Each child should choose or be given a pirate name, written on a sticker and stuck on their top. The first activity could be a peg-leg race (3 legged race). The winners will earn themselves pirate gold-medallion necklaces handmade or bought from a pound shop. Next up, play sink the ship. Fill the bath with some cold water. Using two takeaway containers (like those from a chipper) as the ships, place them in the bath water. Give the first two players an equal amount of rubber balls or “bouncy” balls. These are the canons and they must load the ships up with canons. These balls will be trickier to use as they will no doubt bounce off the bath and wall before hitting the ship, adding to the amusement. You can have the players stand as near or as far away from the bath, depending on age and ability. Whoever’s ship sinks first wins. Hold a treasure hunt in the garden or around the house. Write clues on parchment paper and burn the edges to make it look weathered or fold copy paper numerous times so it looks a bit battered and worn. The clues could read something like: Ahoy me hearties the treasure hunt has begun. Just follow yer clues and the treasure chest ye will win. Shiver me timbers me ship is freezin’! If we had one of these it’d be mighty pleasin'” The next clue would then be hanging from the fire place. The map should lead your pirates to the treasure chest, which could be a cardboard box decorated and filled with sweets or a pirate themed pinata. Ensure the loot is divided among all the pirates. You could serve chicken/fish goujons, which they could spike with little plastic swords/skewers, and a Pirate Ship Cake would be perfect for your little pirates. 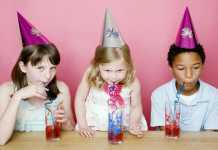 Have you tried any of these party themes or do you have any further suggestions for saving money on boys parties? Tell us about it in the comments below.